After a fierce fight in one of the most difficult and extreme marathons in the world, Tenzing-Hillary Everest Marathon 2014, EDC engineer Radek Serwinski scored 2nd among foreign runners. The marathon is divided into two runners categories –one for the native Nepalese and the second for people from other countries. “I started running three years ago and in the beginning it was more entertainment than serious training. The turning point came when I joined EDC Runners and discovered running again. In 2013 I participated in Baikal Ice Marathon, taking the 4th place in it. This experience was so addictive that I decided to try something else. 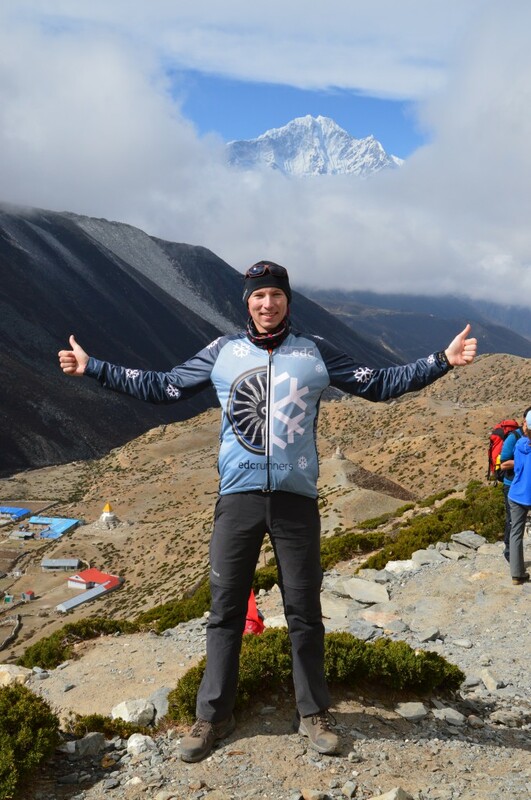 Bartek Matczak, the first EDC Runner in Nepal – told me about Tenzing-Hillary Everest Marathon. Firstly, I thought it was crazy and impossible to do it. I couldn’t imagine running so high in the mountains, but in the end I took the challenge.” – said Radek Serwiński. In the foreign category, the first two places were taken by Polish runners – Robert Celiński from Lotto Extreme team came first and Radek got to the finish line as second with time 5:43.05. Robert’s time was 4:39.39. “The whole event surpassed my expectations. I have never thought I would see Everest and Lhotse with my own eyes. So, the third world marathon has passed… What will be next? We will see.” – added Radek. Tenzing-Hillary Everest Marathon is held every year, since 2001 on May 29th to celebrate the anniversary of the first successful Everest climb made by Sir Edmund Hillary and Sherp Tenzing Norgay in 1953. Start of the marathon is located at 5364 meters above the sea level, which makes it the highest one.